With all our coverage of privacy, security, and account settings, April was a pretty heavy month here at Learning for Life Online. Let’s celebrate spring by lightening things up a little bit in May. We’ll start by showcasing five search engines (similar to Google or Bing) that you might not have heard about. 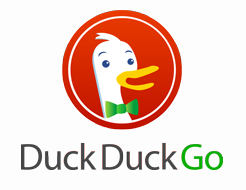 Duck Duck Go is a nifty alternative to Google, Bing and the rest. To use this all-purpose, general search engine, just type in whatever you’re looking for into the search box and click. For tips, tricks and shortcuts to get very specific information quickly, check out their special “goodies” searches page. What if you’re not looking for the most popular results? What if you want something obscure, or want to find the small stuff without having to skip past all the answers you already know? Try Million Short, a search engine that will let you cut off the top million, hundred thousand, thousand, or hundred results and get to websites and pages you may have never seen before. This isn’t a search engine you’d use all the time, but if you want to really research a topic online, it would help get to the weird stuff more quickly. Spezify is an entirely different kind of search engine – rather than a list of results, you get a visual collection of images, video and text spread out in front of you. No, it’s not in a particular order, but you can quickly see whether something is useful to you by just looking. Lots of fun, especially if you’re looking for photos or images. EcoFreek is a search engine that specifically looks for items that other people are giving away, willing to swap for, selling at a garage sale, or are otherwise free or really cheap. Type whatever you’re looking for into the search box, choose what part of the world you’re in, then click Search. You’ll get a list of results with a short description; if one of them sounds like what you want, click through to the original listing to see if it’s still available. Tired of searching Amazon first to find books to buy? Try BookFinder, a search engine just for books. It’s great for out of print or hard-to-find items, and has an international focus for better non-English language materials. I Like Using Google – Why Change? If you were shopping for just the right shirt, you wouldn’t look in one store and then stop when you didn’t find it, would you? Same thing with search engines – the same one will tend to give you the same sorts of answers. To really know what’s out there, you need to try your search in different places, and compare the results you get from each one. There are hundreds of search engines available, some more general and some for very specific topics. Don’t just trust results from the big three – take one step further and see what else is out there. This entry was posted in This Week on LLO, Tools and tagged bookfinder, books, duck duck go, ecofreek, images, million short, search engines, searching, spezify, surprisingly useful tools, visual search on May 7, 2012 by Jennifer Koerber.